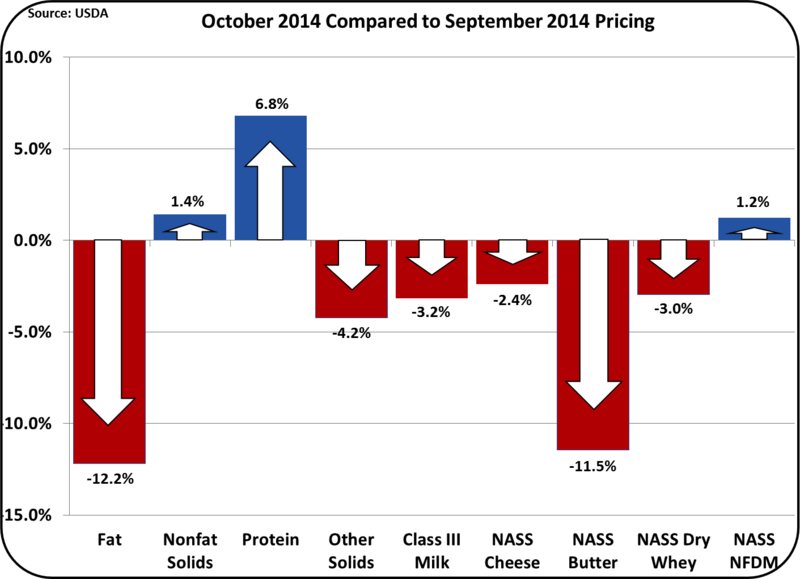 In the prior post, the fall in dairy commodity prices was analyzed. While new export data was not available at that time, they were suspected as the culprit. Export data became available shortly after that post and will be analyzed in this post. As suspected in the prior post, dairy exports did fall significantly. This post will analyze the export data. To put things in perspective, the pie chart below shows the values of export categories for the first nine months of 2014. They total 5.7 billion dollars and account for 15.5% of the U.S. dairy production. Nonfat Dry Milk is the largest category in USD, and has a much larger share in tons exported. In 2013, the U.S., for the first time, became the world's largest exporter of Skim Milk Powder/Nonfat Dry Milk, exporting 555 thousand metric tons. 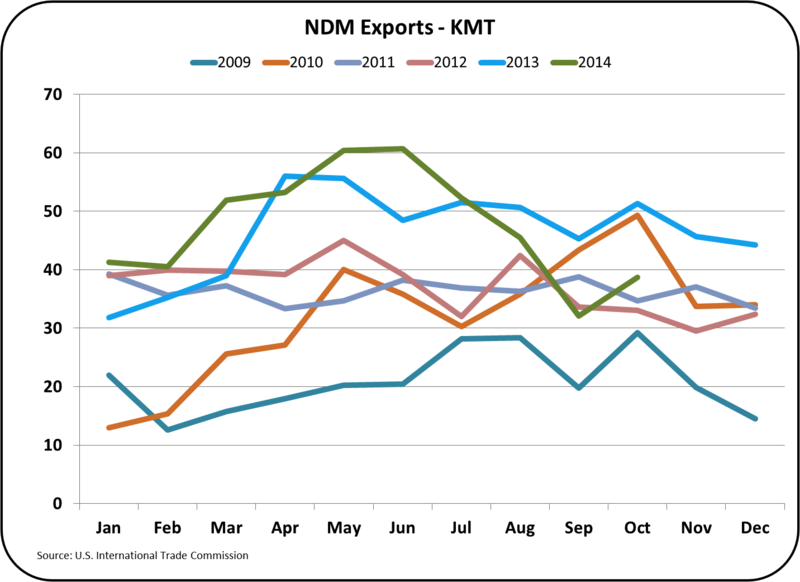 The chart below shows the other SMP/NDM exporting countries. 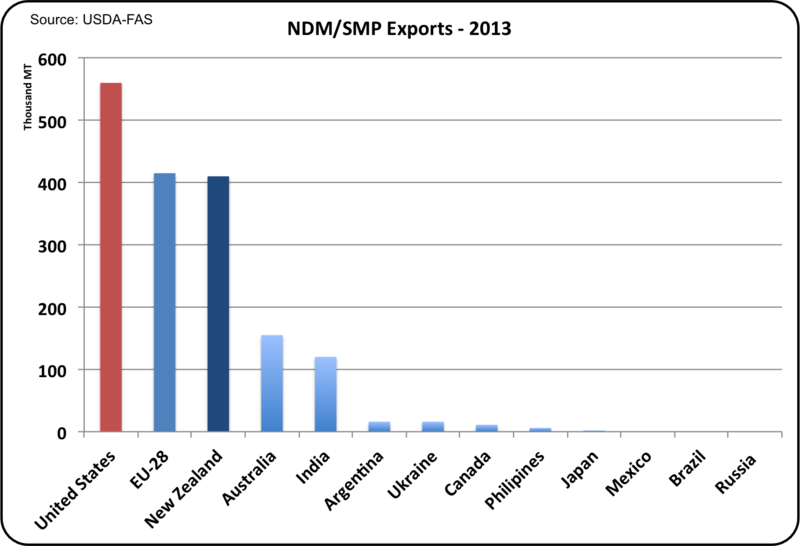 The EU and New Zealand are major exporters of SMP/NDM, and competitors for this business in the international markets. For the first ten months of 2014, the U.S. has exported 469 thousand metric tons of SMP/NDM. To match 2013's volume level, the U.S. would have to export 43 thousand metric tons in November and December. Exporting that level is still possible, but for the last two months, the U.S. has been below that level. In October, there was a slight gain in exports, so recovery may be in process to meet the 2013 record export levels. 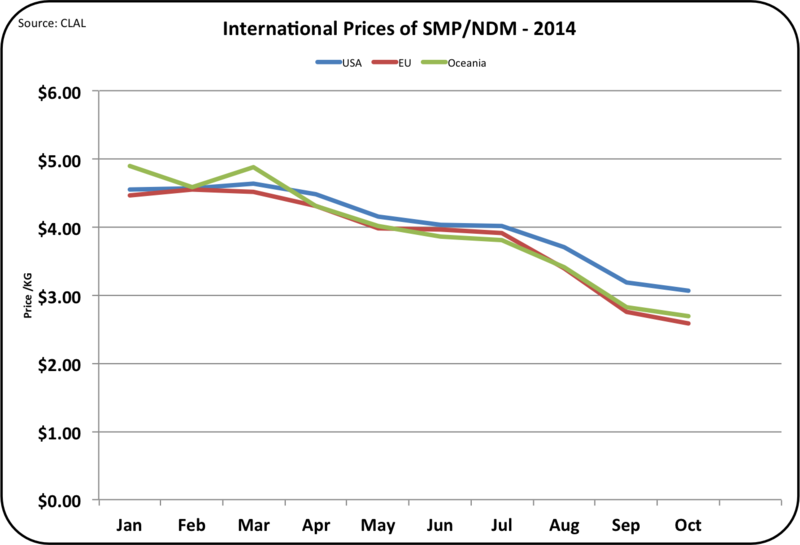 Prices for SMP/NDM have fallen internationally. International prices are important because to date, 54% of the U.S. SMP/NDM have been exported. The Export price closely matches the domestic price. 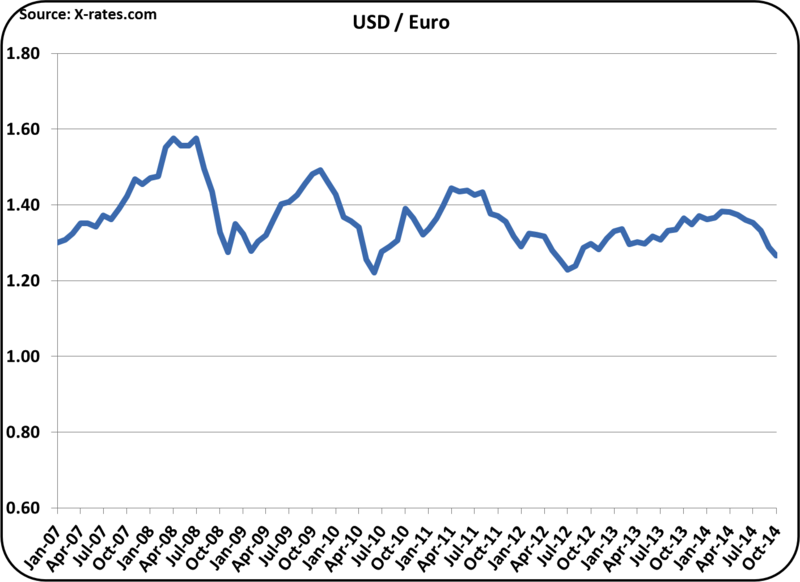 As shown in the chart below, the U.S. has held prices above the EU and Oceania, but that higher pricing is hurting export volumes. With higher prices export volumes will not recover, domestic inventories will increase, and domestic prices will fall. On the other hand, if prices are lowered on exports, domestic prices will also fall. Either way, a domestic price decline is likely. Cheese is probably the most important product to review. This is because the price of cheese, as determined by NASS, is the major variable in pricing milk. 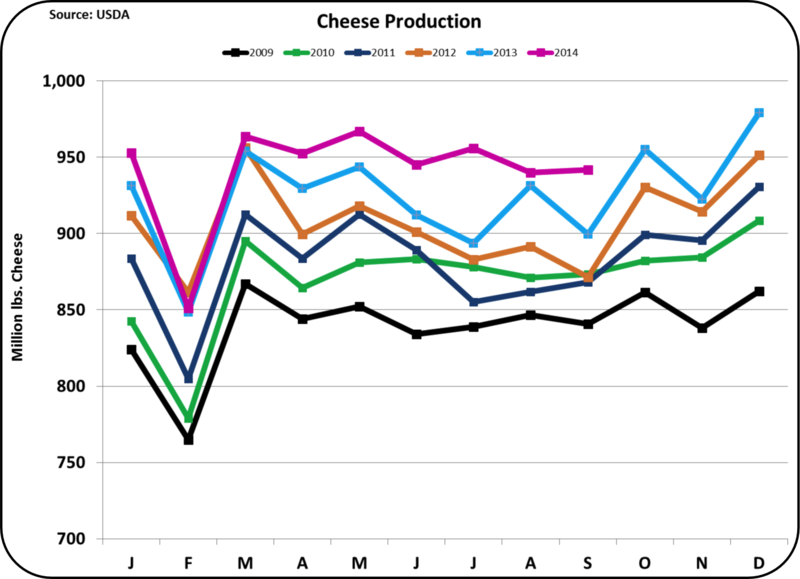 Cheese exports have more than doubled in the last five years and now account for 7.4% of production. However, that export volume is declining. If volumes continue to decline, it can quickly bloat domestic inventories and hurt domestic prices. Traditionally, Mexico is the largest export customer for the United States. In October, Mexico's imports fell 16% from their 2014 running rate and South Korea became the largest export customer. This may be a short-term situation, but bears watching. The biggest export drop was in butter. 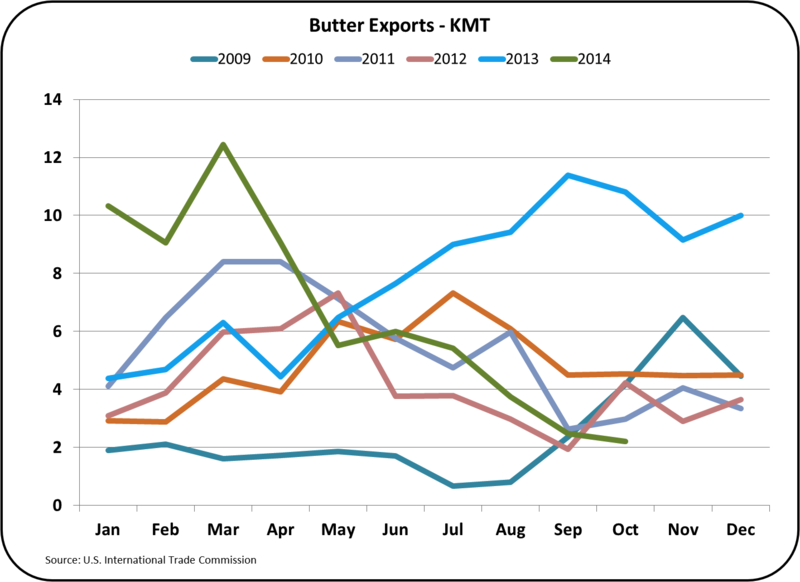 The all time high volume of butter exports occurred in March 2014 with over 12,000 metric tons exported. This depleted domestic inventories and caused historically high butter prices. In October, just over 2000 metric tons were exported. This should certainly allow domestic stocks of butter to recover. 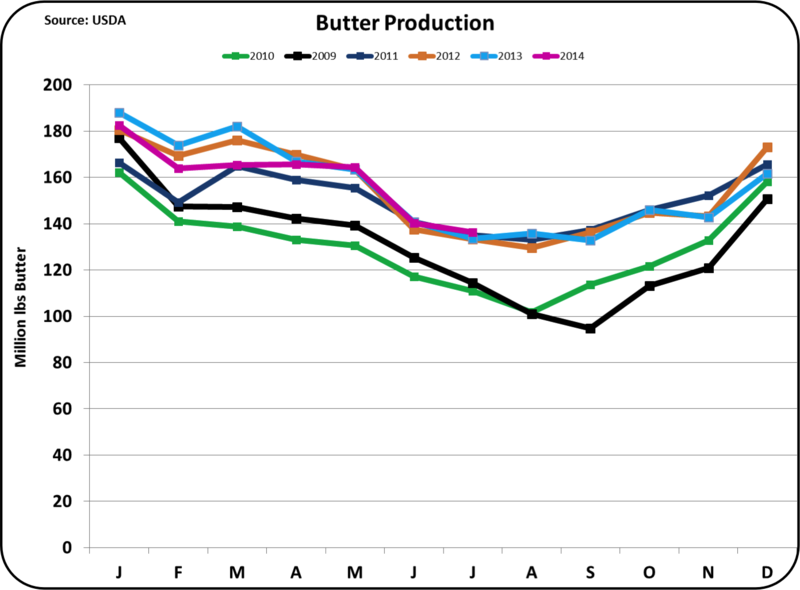 For a view of butter stocks over the last six years, click here. 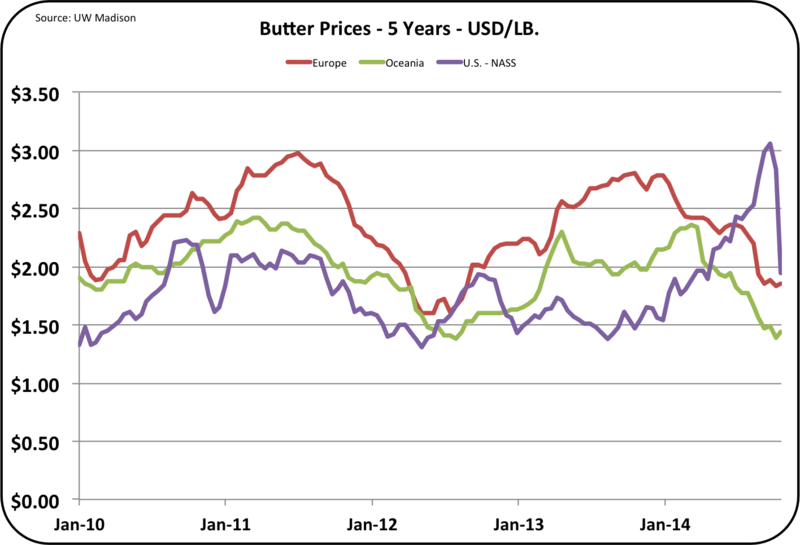 Currently butter prices are declining and are expected to fall further. 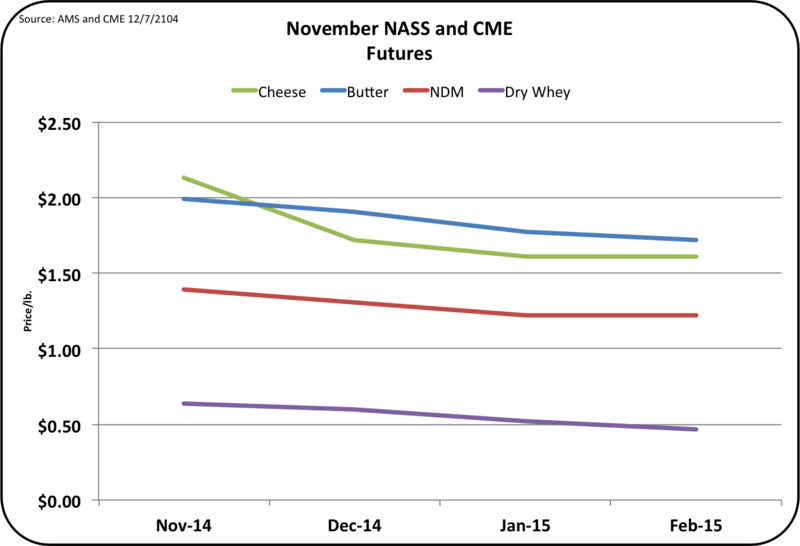 This fall will bring butter prices more in line with long-term trends. As long as churning capacity is not increased, the U.S. cannot be a major butter exporter. 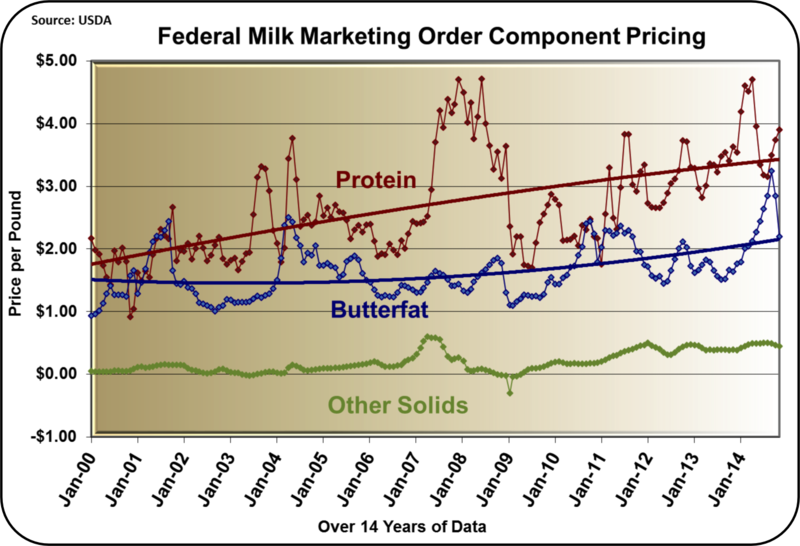 For a view of butter prices, click here. 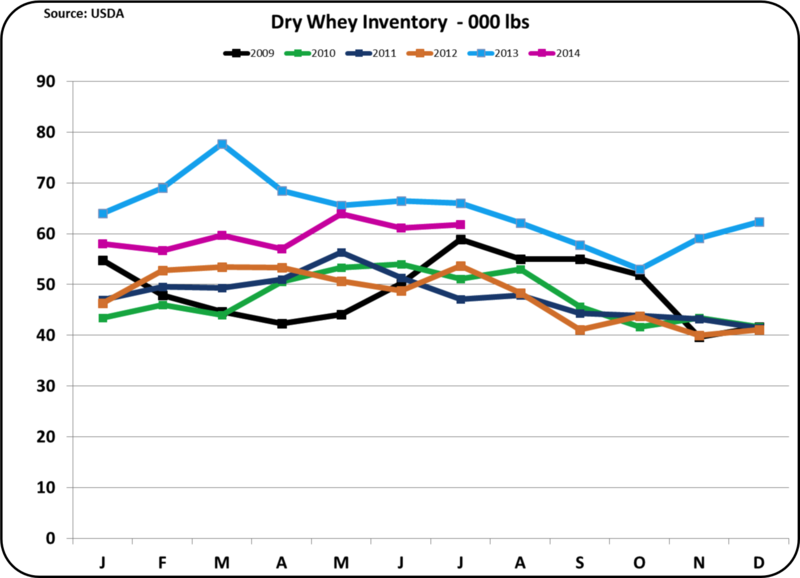 Dry Whey is the fourth and final commodity, which directly influences producer prices. To date, 60% of the dry whey produced has been exported. 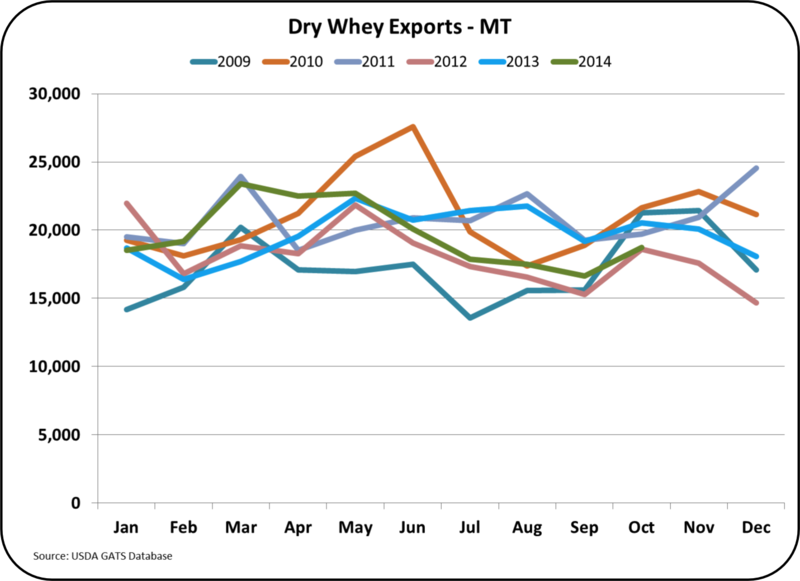 Exports remain strong, and dry whey prices are maintaining the level of 2014 prices. 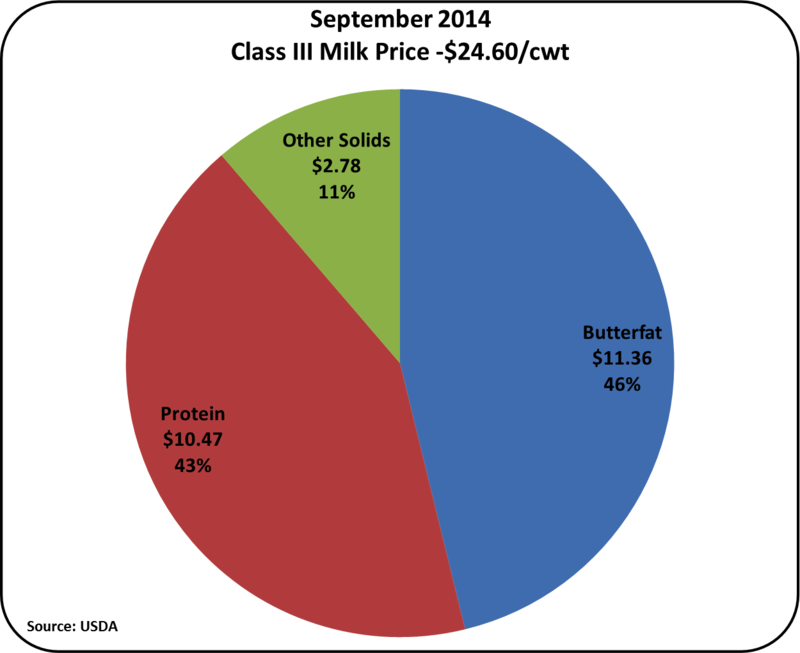 As a result, the price paid producers for "Other Solids", which is based on the dry whey price, also remains healthy. There is one other market of interest, because it is a developing market for the U.S. Whole Milk Powder (WMP) does not have a market in the U.S. This is due to adequate refrigeration of fluid milk, excellent logistics for fluid milk delivery, and consumer buying habits. WMP is strictly an export market, dominated by one major buying customer, China. Production and inventories have varied tremendously. However, WMP exports, while small, are the strongest growing U.S. export item. WMP exports are up 46% YTD. 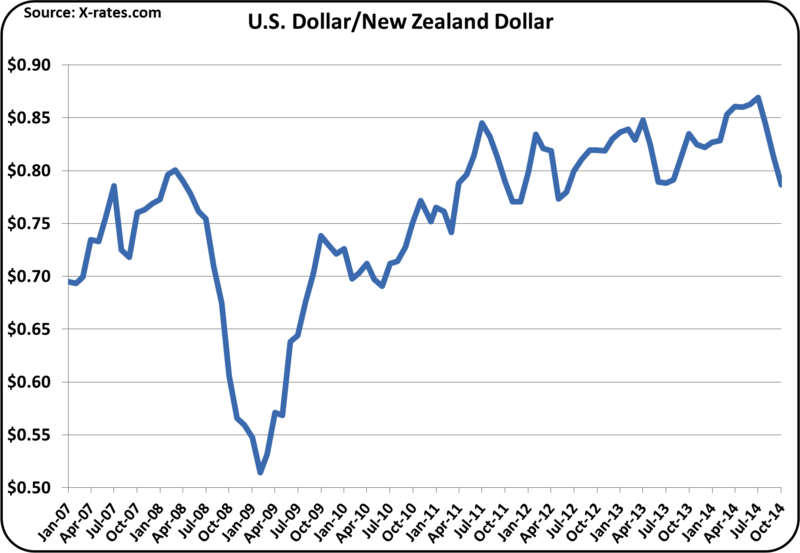 Recently the market has cooled off and exports are tracking at last year's level. U.S. exports of whole milk powder are only about 10% of those for SMP/NDM. This is a market of high risk, but it is the largest export category globally and penetrating it could have big returns. 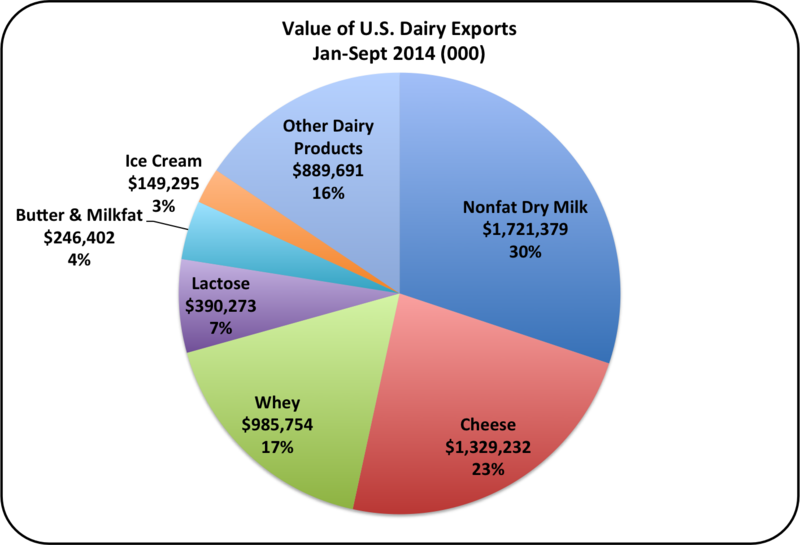 Exchange rates are adversely impacting dairy exports. 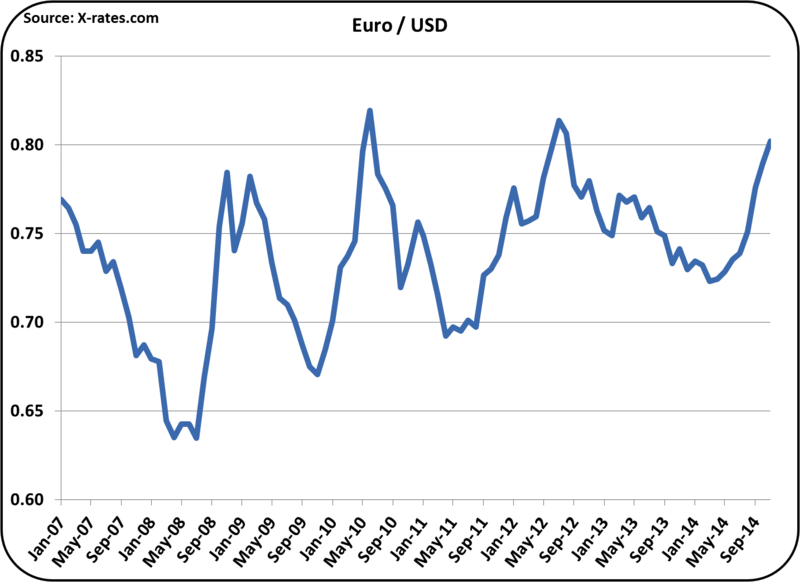 The strongest impact is vs. the Euro. This comes at a time when Europe's dairy industry is concerned about over production as a result of the recently implemented Russian embargo. The European dairy industry needs to export more dairy products and a weak Euro helps them accomplish this. 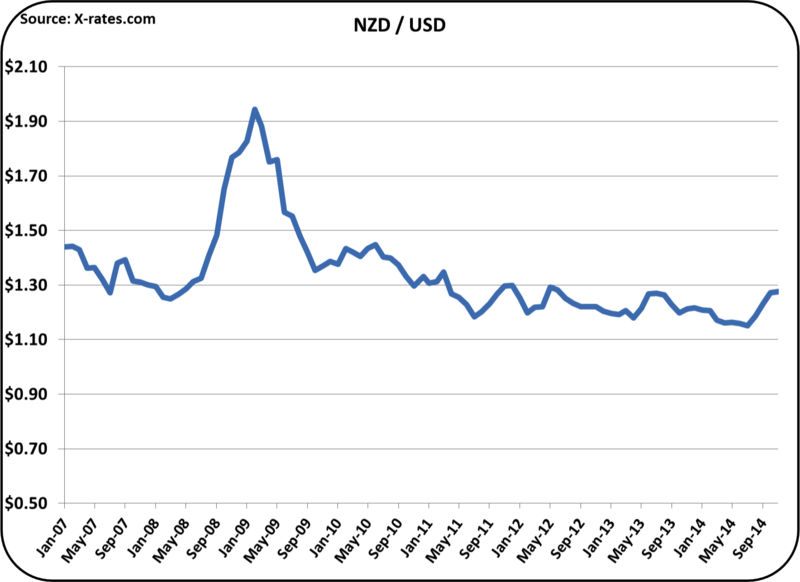 The NZD has also weakened against the USD, helping New Zealand export their dairy production. The EU and New Zealand are the two largest dairy exporters, and represent strong competition to the U.S. The strong USD gives these competitors a pricing advantage. 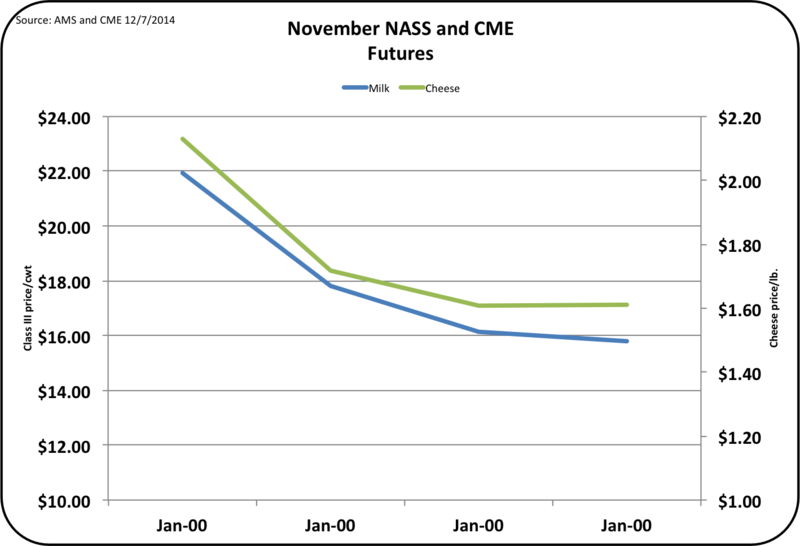 Producer milk prices, as predicted in the CME futures market, show prices falling by 1/3 from the 2014 highs in the next few months. 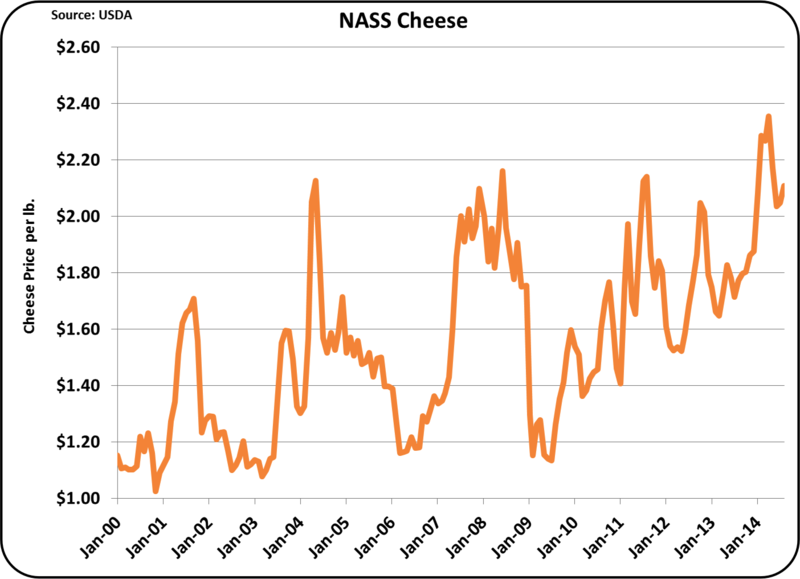 Cheese prices, which are the primary basis for milk prices, are similarly priced. 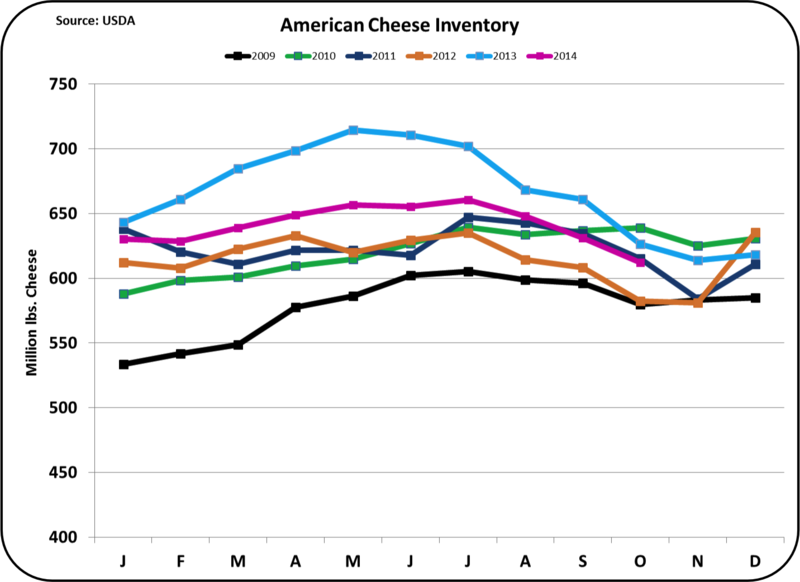 This assumes a continuing drop in cheese exports that will bloat domestic inventories and cause prices to drop. An examination of cheese exports in detail doesn't support this. The long-term best customer for cheese is Mexico. In October, their imports were off, causing them to be the "second best" customer after South Korea. 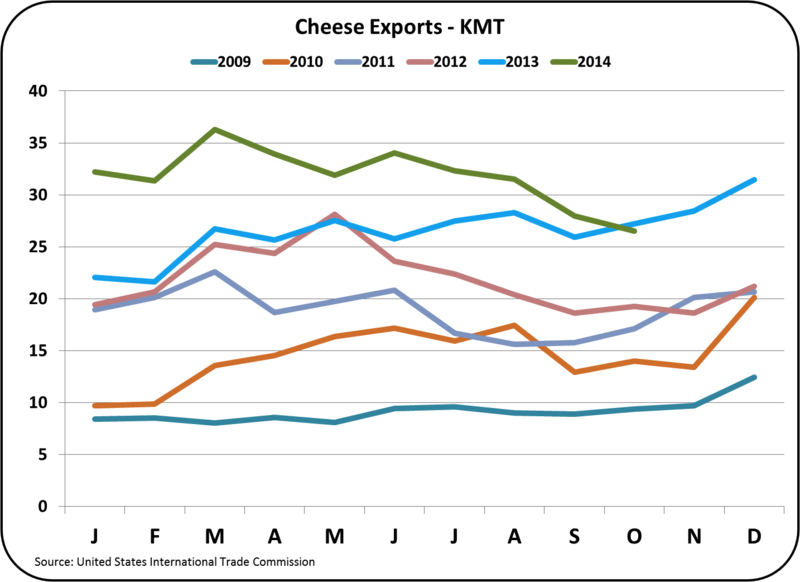 We do continue to see increasing U.S. cheese exports in many other parts of the world, notably in the Far East counties. Exports to Mexico, that have dropped in the last few months, are not reason enough to expect a long or even a short-term trend of decreased exports to Mexico. While the future is always uncertain, exchange rates between the Mexican Peso and the USD have shown only a slight strengthening of the USD. It would therefore be reasonable to expect exports to Mexico to increase to the prior higher levels. 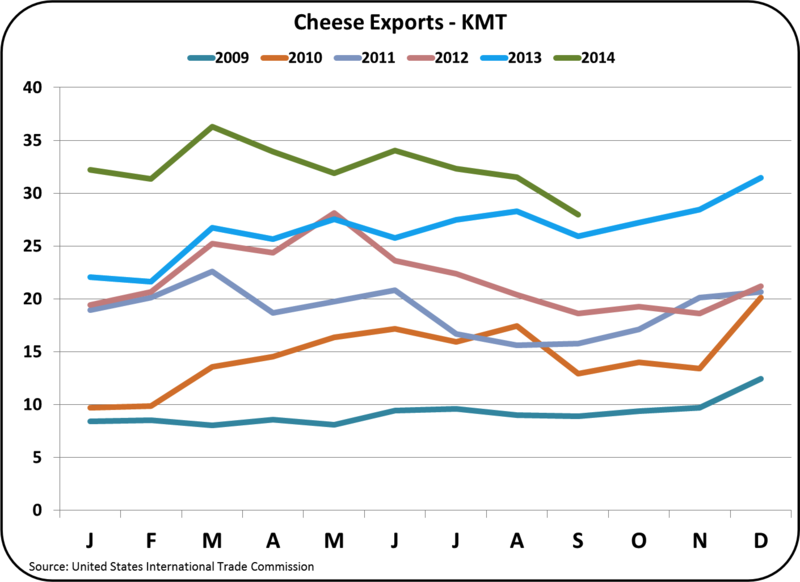 With the strengthening of cheese exports to other parts of the world and a recovering market in exports to Mexico, a stable to increasing level of cheese exports is not unreasonable. With that would come strengthening prices for cheese and milk. 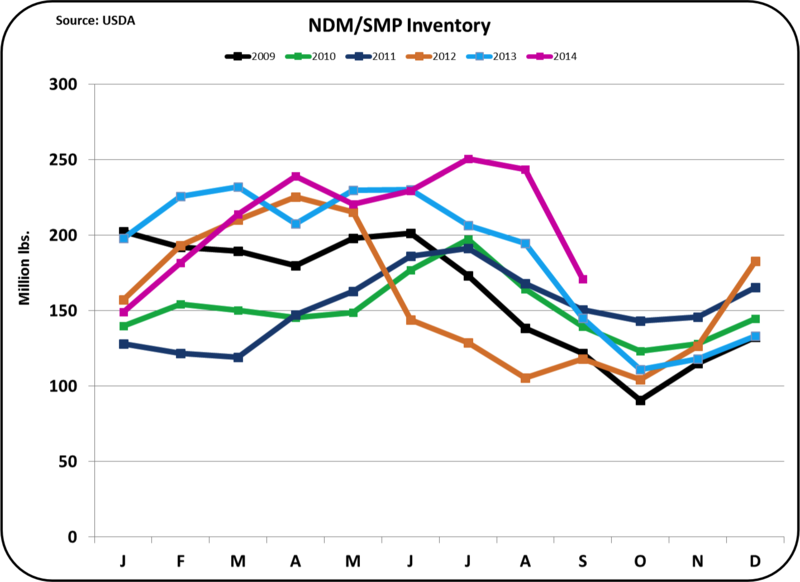 As for SMP/NDM, lower prices continuing well into 2015 are reasonable. 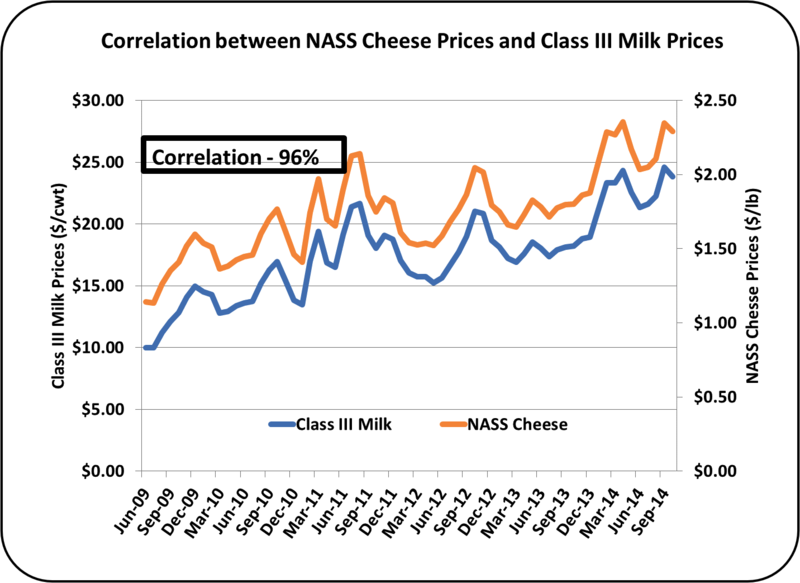 The contribution of the high SMP/NDM prices in 2013 and early 2014 were the basis for a nice addition to milk prices, but not of the magnitude of cheese prices, so their impact should be less. 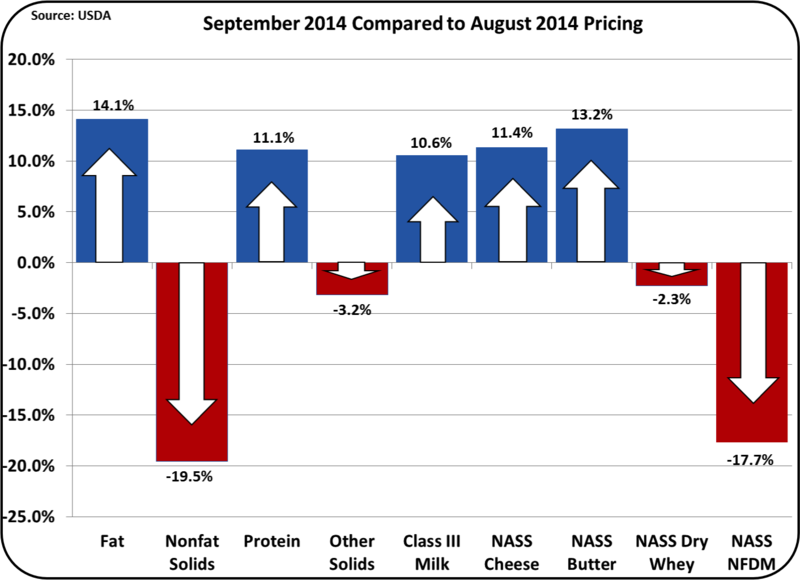 Class III milk and component prices for August 2014 were announced on September 4. The Class III price was near record levels and the Class IV price was a record. 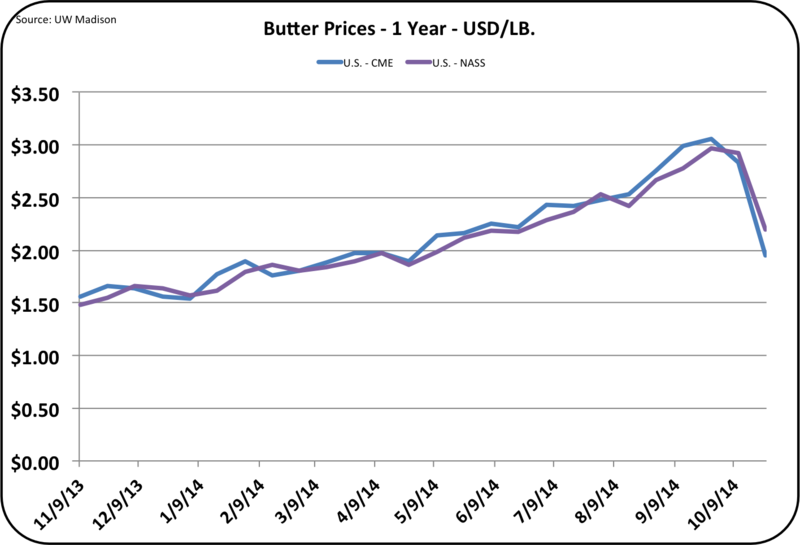 The big news is again the price of butter, which has shot to record levels never seen before. 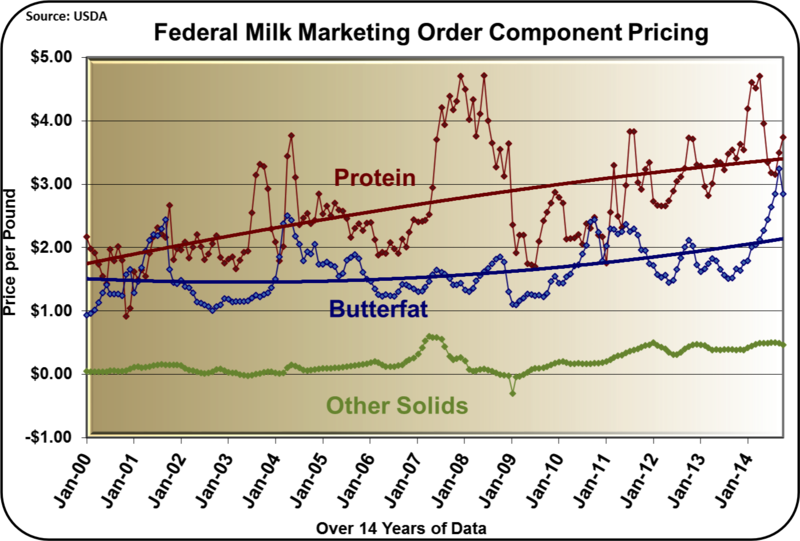 An in-depth review of the reasons behind the very high butter prices was covered in the last post and will not be repeated here. 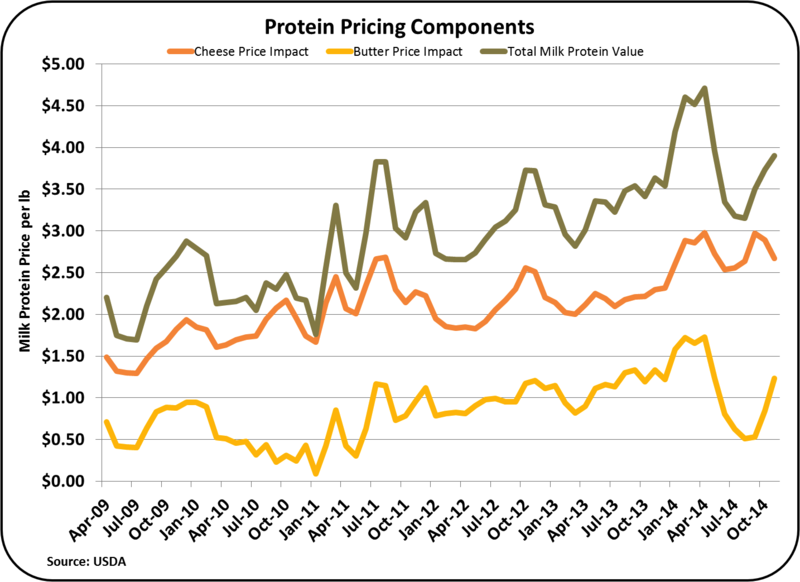 Protein prices dropped slightly in spite of an increase in the NASS price of cheese. 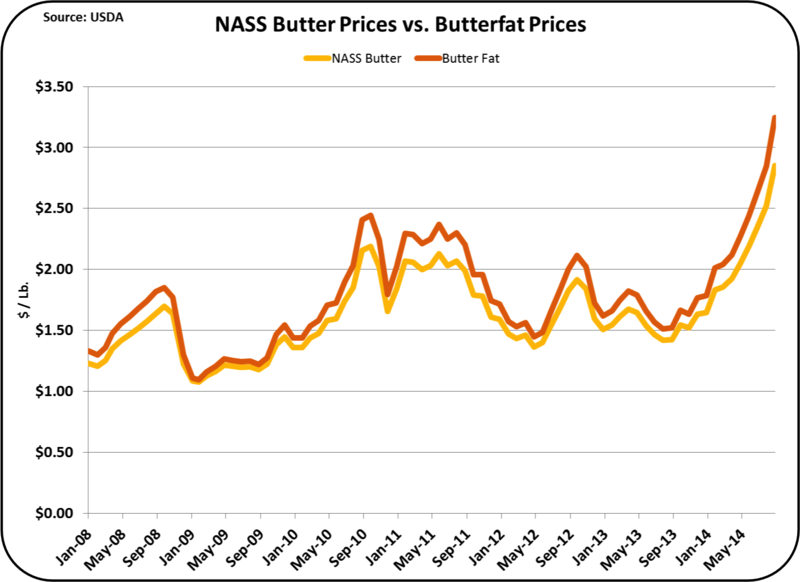 The NASS price of butter was up 7.8%, which increased the price of butter, but decreased the price of protein. For an explanation of this mathematical relationship, see the August 8, 2010 post to this blog. The long term trends shown below reflect the current component pricing situation. 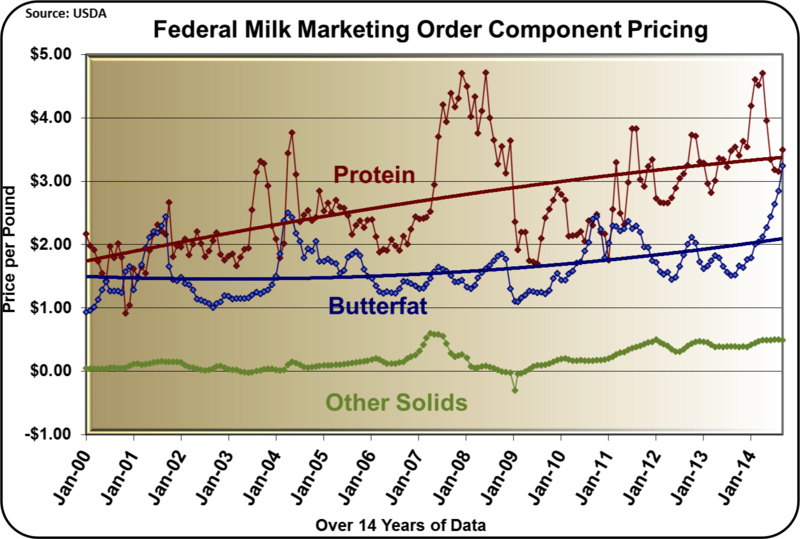 Butterfat is at a significant record price. 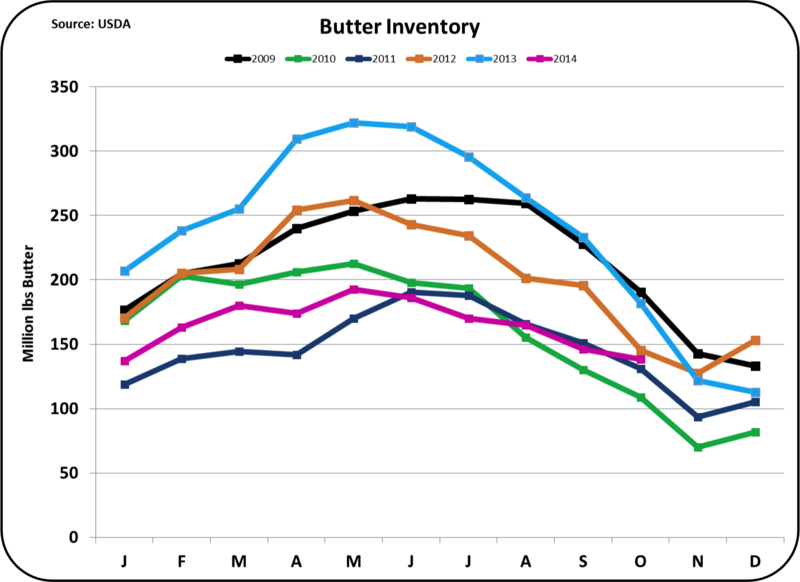 Inventories of butter remain low which was caused by very strong exports. Butter churning has yet to catch up. 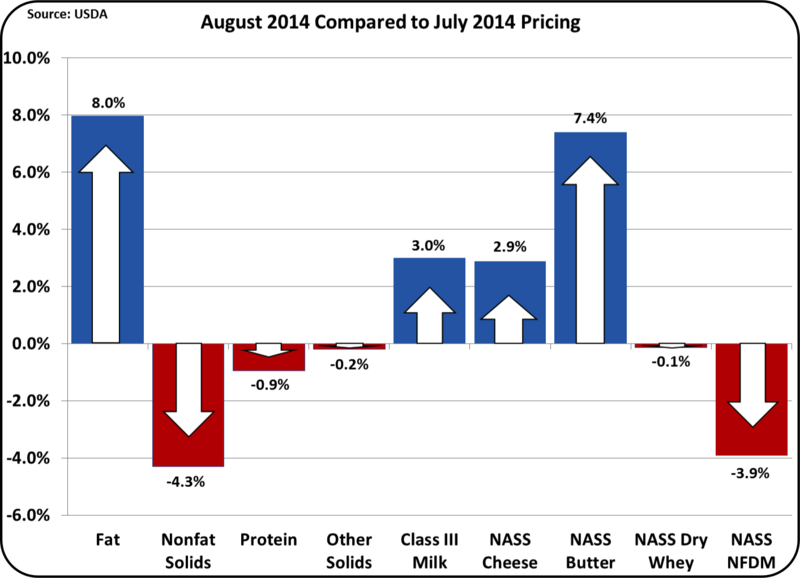 The August drop in the price of milk protein is totally the result of the record high butter price. 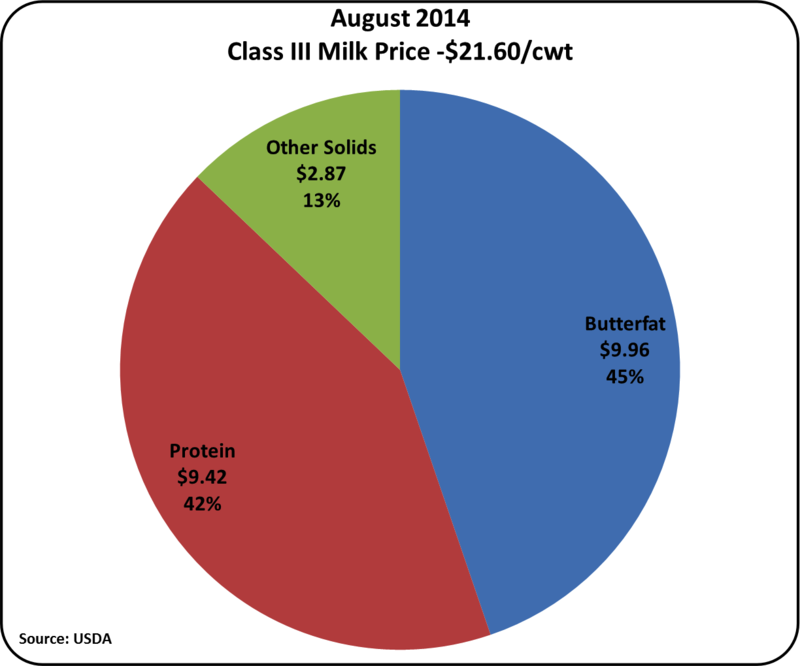 The pie chart below shows a very unusual component make-up of the August value for Class III milk. 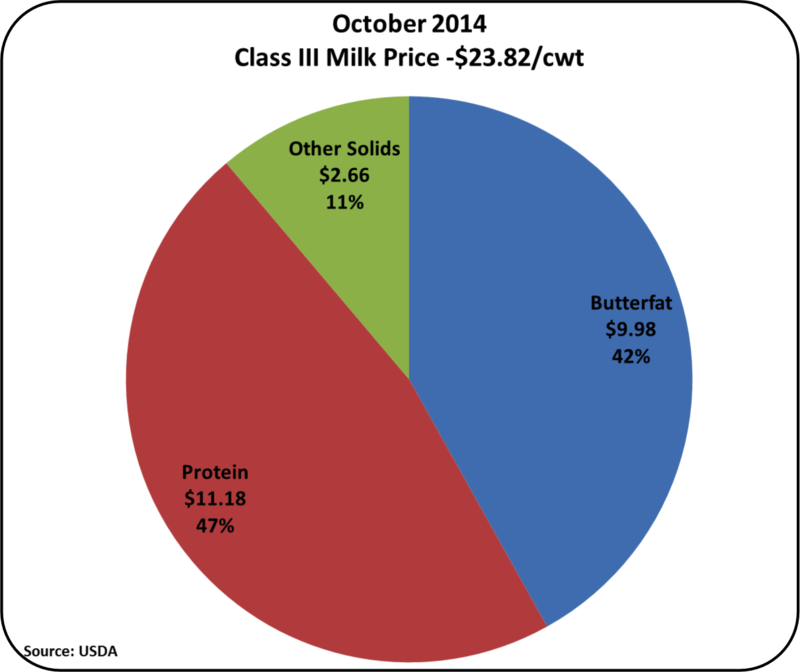 Butterfat is now contributing more to the Class III price than milk protein is contributing. 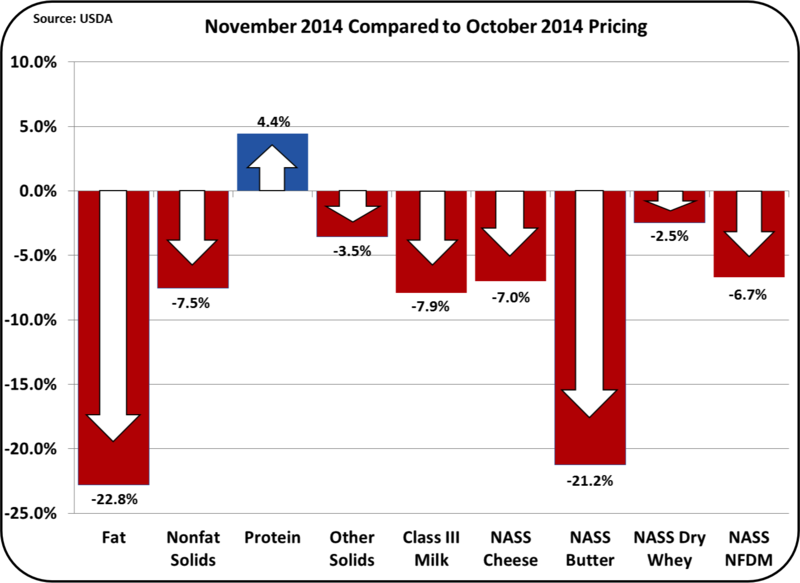 As expected, the price of nonfat dry milk, which is the basis for the Class IV skim price, fell slightly. 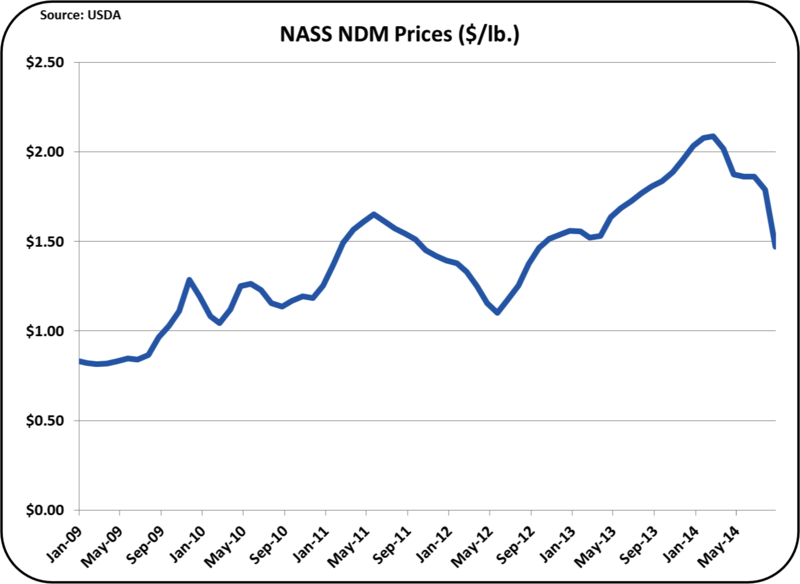 The global market price of nonfat dry milk/skim milk powder is falling, and the NASS price is really governed by the global price as the majority of U.S. nonfat dry milk is exported. 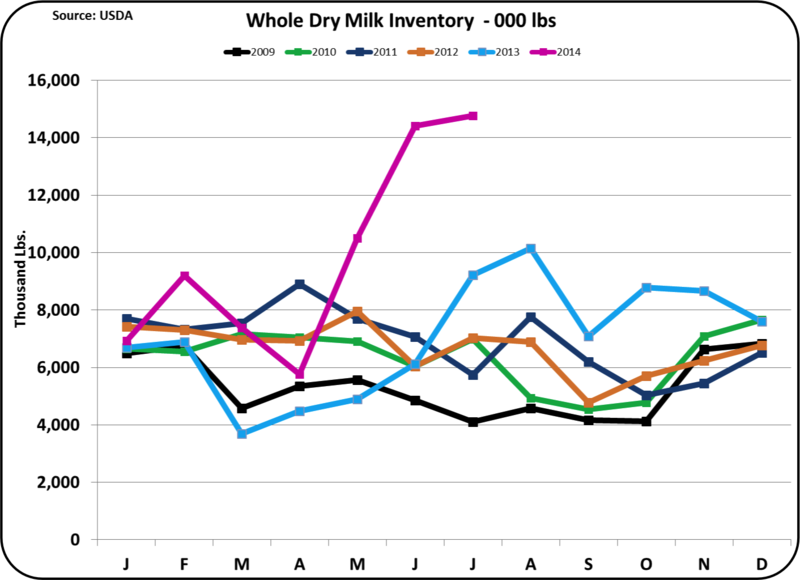 In spite of this drop, the still high Class IV skim milk price and the resulting differential between Class IV and Class III skim milk prices, continues to benefit most all U.S. dairy producers. See the February 14, 2014 post to this blog for an explanation of this relationship. 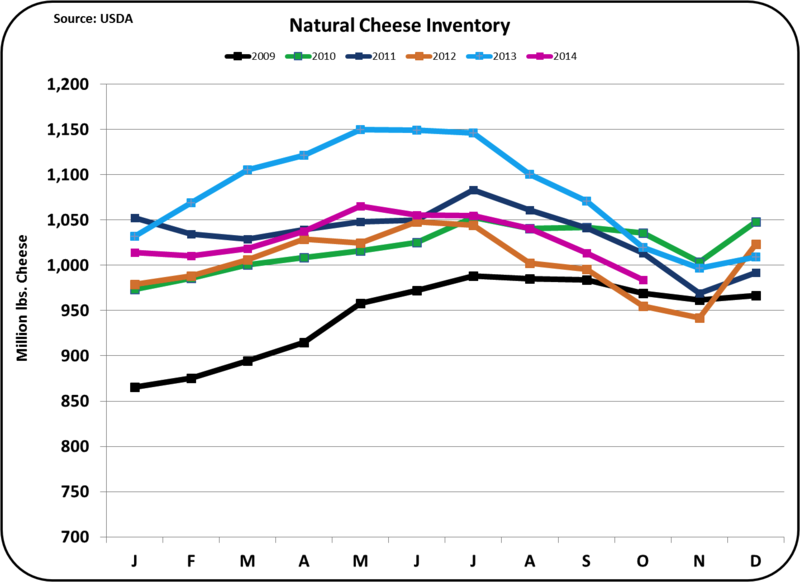 Inventories of both butter and cheese are low. The most significant of these is the butter inventory. 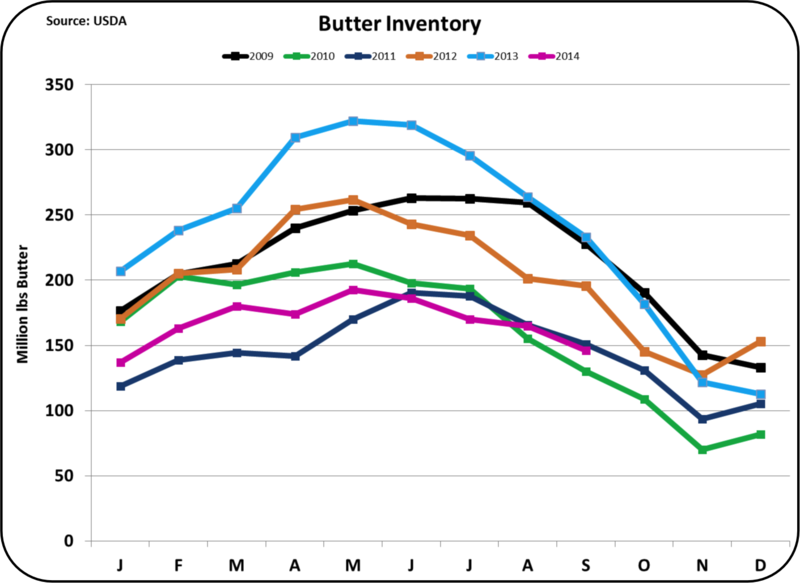 As of the end of July, the butter inventory is lower than anytime in the last six years. (August data is not yet available.) 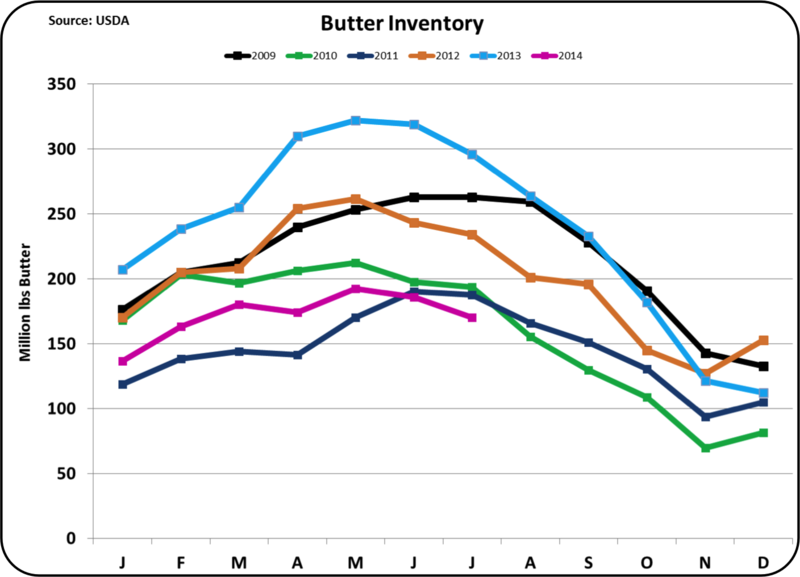 Exports in late 2013 and early 2014 depleted butter inventories and churning has not increased sufficiently to rebuild these inventories. As shown in the chart below, butter churning is running at the level of the last four years, and this level does not allow recovery of the low inventories. 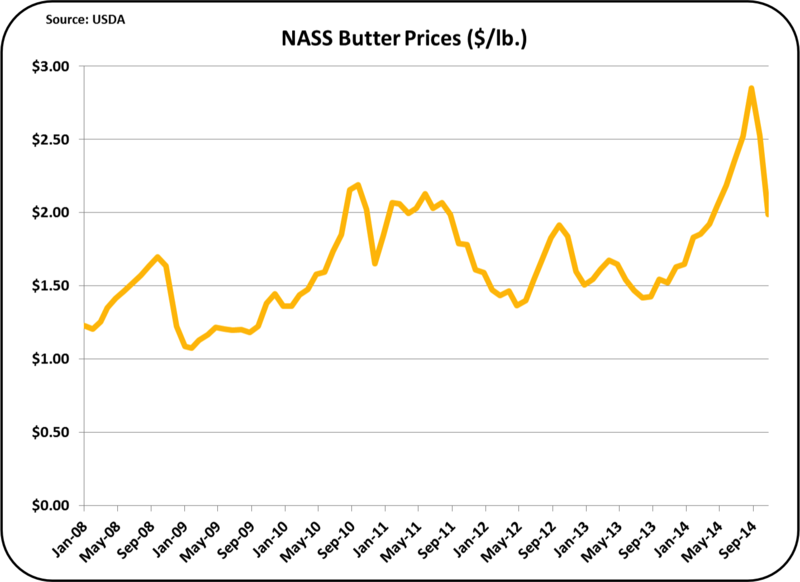 With the extremely high butter prices, there should be a strong incentive to produce more butter. 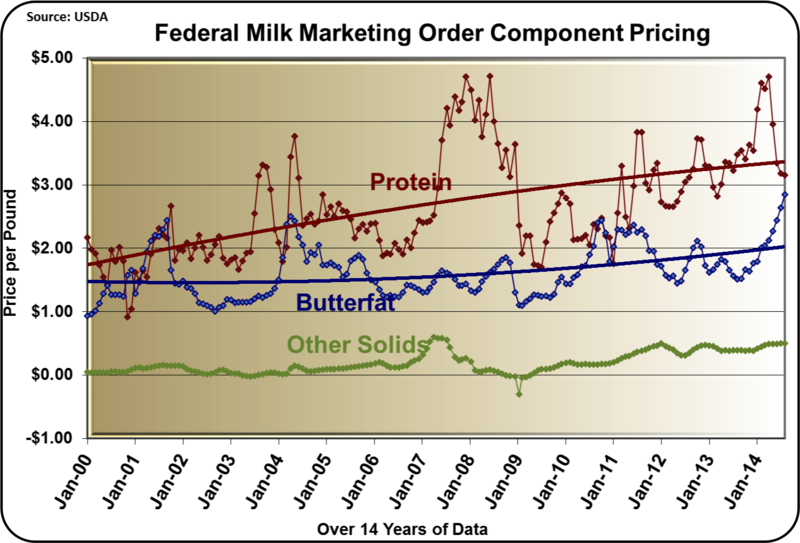 However, the Federal Milk Marketing Order pricing model pegs the price paid for butter churning and this "make allowance" has not changed in years. Therefore, butter churners are paid the same price per pound for all butter churned and the benefit of the current high butter prices falls to the dairy producers. Other than the standard make allowance for churning, there is no additional incentive to churn additional butter because of the low inventories. The current level of exports may be playing a role here, but current export data will not be available for August until mid October. 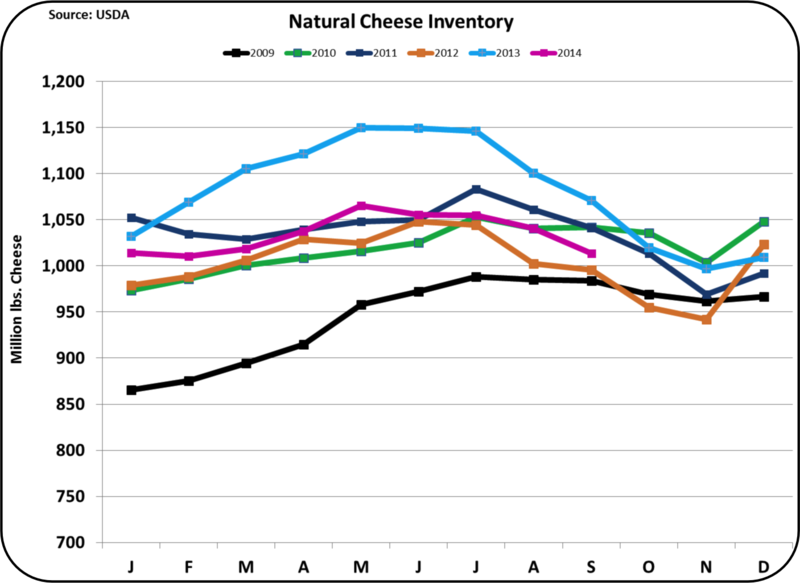 Cheese inventories are also very low. 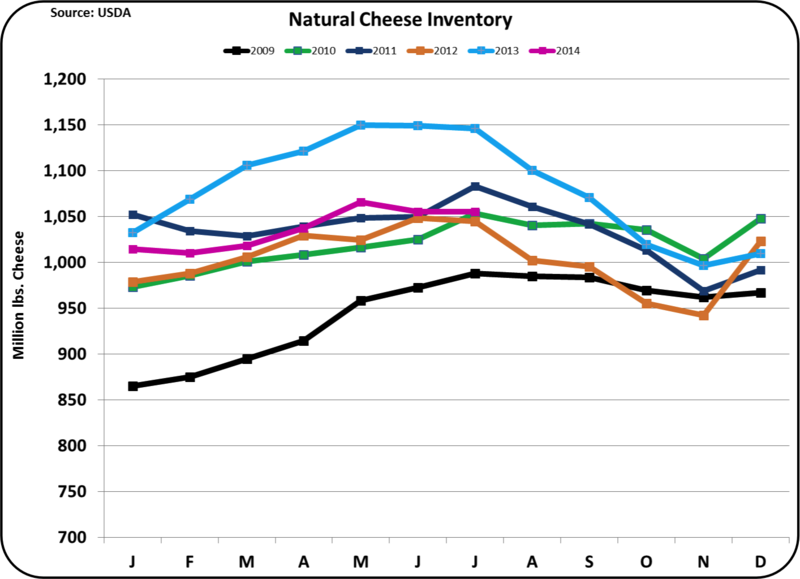 Cheese consumption and cheese exports are both growth categories and inventories should be increasing to keep the days of inventory constant. This is not happening and when inventories are low, prices will rise. 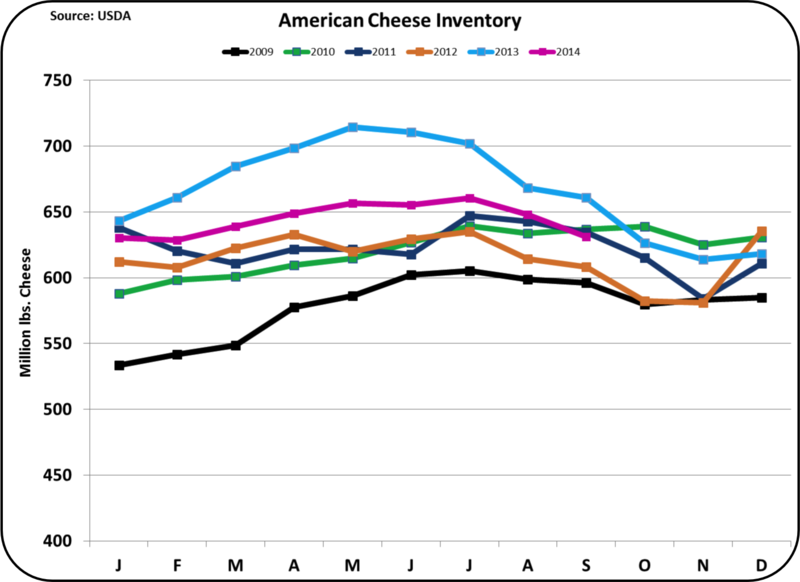 Natural and American cheese inventories are shown below. 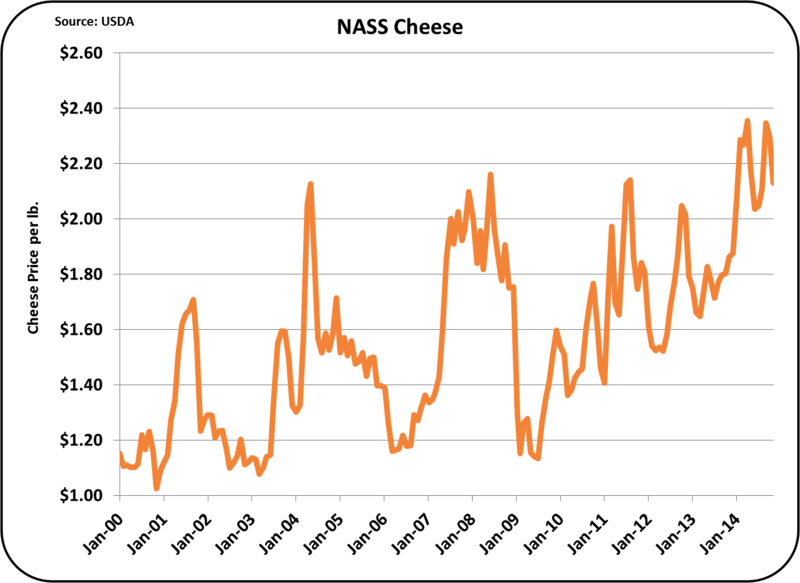 The NASS price of cheese did increase in August, but it is not near record levels. 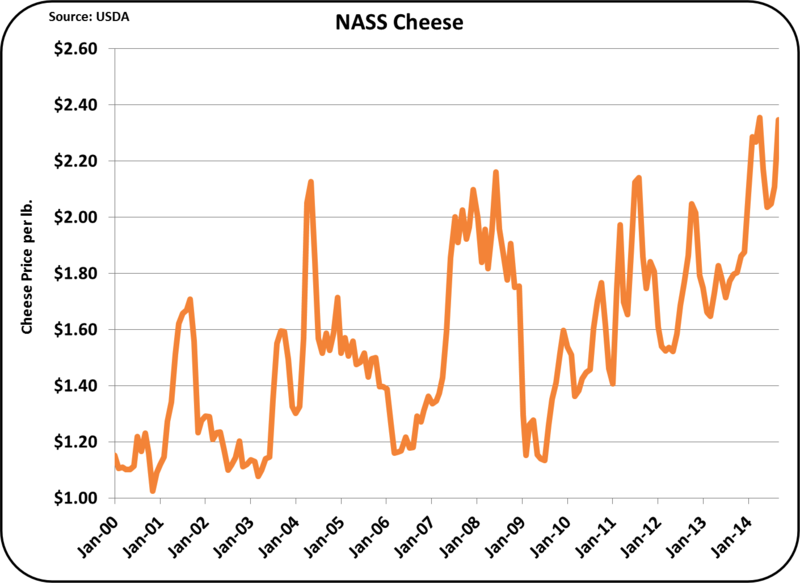 The NASS cheese price in August was $2.11/lb., above the prior month of $2.05/lb., but well below the early 2014 record prices, which peaked at $2.35/lb. Dry Whey prices are the basis for pricing "other solids." Dry whey is principally an export item. 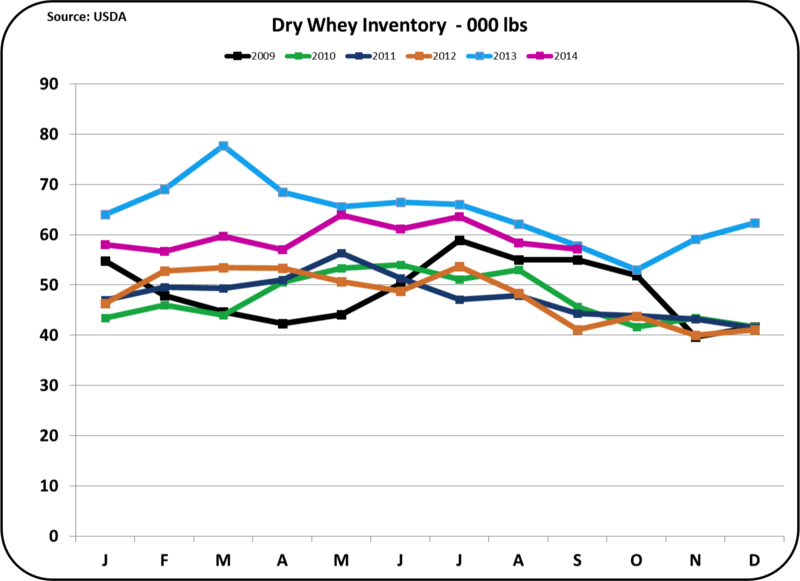 In August, the price of dry whey was $.69/lb., a current record and up slightly from the prior month. 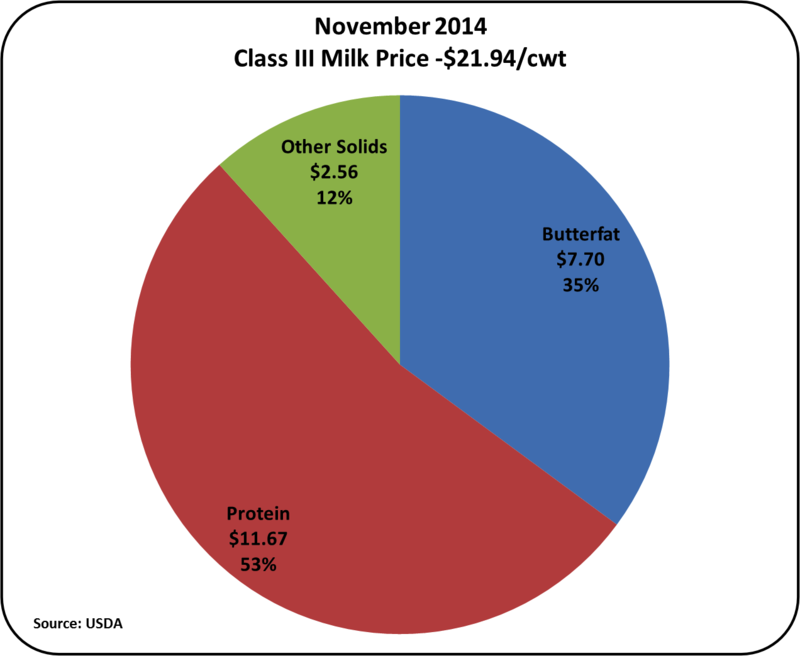 "Other solids" continue to contribute nicely to the Class III milk price. Whole milk powder has a huge international market. While the U.S. has not significantly participated in this market, there has been some production and export activity recently. This export market appears to have fallen apart again and inventories have skyrocketed. As a result, production has quickly fallen off. This is a very volatile market with a history of difficulty. Whole milk powder is only a small niche market in the U.S., and is discussed here only because of the dramatic change. The dairy business is always changing and the dynamics of becoming a global exporter have increased the volatility. Overall, producer prices for milk are currently very positive, mostly the result of strong exports. The new and developing trends will always be reviewed in this blog.